Our clients can avail from us an extensive range of Brass Forging Furnaces. These are based on cutting-edge technologies, which meet the processing demands of various alloys such as brass, zinc, copper & other non ferrous material. With our expertise in this domain, we are able to deliver our range in custom-built form as per the clients’ specific requirements. 2010-11 Rs. 1-2 Crore Approx. 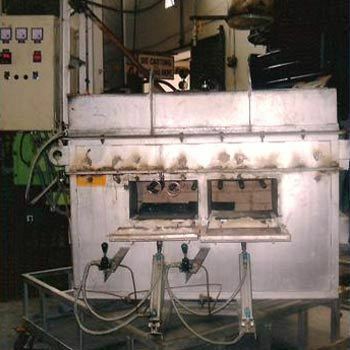 We are engaged in manufacturing and supplying a wide range of Industrial Furnaces and Industrial Ovens. Our product range comprises a huge variety of Industrial Furnaces such as Stainless Steel Solutionizing Furnace, Furnace Retots and Melting Furnace. Apart from this, we also offer Drying Oven and Continuous Curing Oven.These products are acknowledged by for their high performance, low maintenance, and resistance against chemical, temperature & corrosion. Our product range finds its wide application in various industrial areas such as pharmaceuticals, chemicals, engineering, and petrochemicals. With our domain expertise, we are able to undertake Furnace Re-Vamping Jobs as per the client's specific requirement. In addition, we are also offering designing and commissioning of Furnace Spares such as Heating Elements, Fan Assemblies, Rollers, SS Cast Tubes, and Heart Plates. Our organization is backed by a sound manufacturing unit comprising state-of-the-art machines like Oregon, CO2 Welding Machine, Profile Cutting Machine, and Rolling machine. We have gained rich client-base across the country including renowned names of the industry like Raymond- J. K. Fils Ltd, Hindalco Industries Ltd., Sandvik Asia Ltd., Vanaz Engineers Ltd., Aditya Industries and Chaitanya Industries.